If you follow me on facebook I mentioned we've been creating with paper bags for TinkerLab's Creative Challenge and now we have far too many ideas and we need to start sharing now! For this activity I presented C with a bunch of supplies: paint bingo markers, pom poms, construction paper, stickers, scissors, markers, and more! And, of course, some paper grocery bags!!! She came up with a Paper bag portrait of herself! Perhaps she was inspired by our Paper Bag Puppets that we did about a month ago? It turns out that this is an activity many Art Therapists use...keep reading to find out more! C got working on her idea right away! She didn't like the writing on the bag, so we quickly covered the words up with yellow construction paper! Then she began drawing a face right away! Soon after that, she began adding more with paint bingo markers, smiley stickers, hair like our construction paper strip sculpture (she reminded me), and more construction paper , and pom poms! Then she said, "I'm done!" Definitely the attention span of a typical 5 year old! And that is why the post is over....that is about how long it took C to make this! I think the paper bag self portrait turned out rather well. ***The interesting thing about this Paper Bag Self Portrait Idea is that it is featured as an Art Therapy Activity here from The Art Therapy Blog. I researched a bit more and found this to be a popular activity that people do in an art therapy session! On the front of the bag you are to make your self portrait (like C did), then on the sides and back express fears, dreams, and aspirations. Then inside the bag put things that about yourself. I love the idea about putting things inside the bag...C would love doing that! 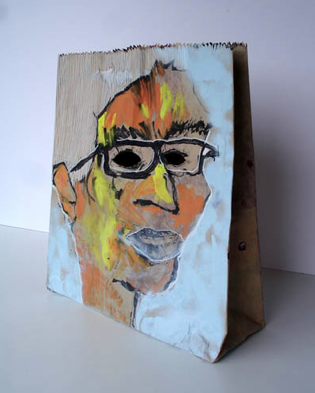 Here is a Paper Bag Self Portrait that someone submitted from the post I mentioned above. Pretty cool, huh? I think so. Now I am inspired to create a Paper Bag Self Portrait! I would love to try this with a group of kids to see what they would create. This would make a great "Getting To Know You Activity" too. 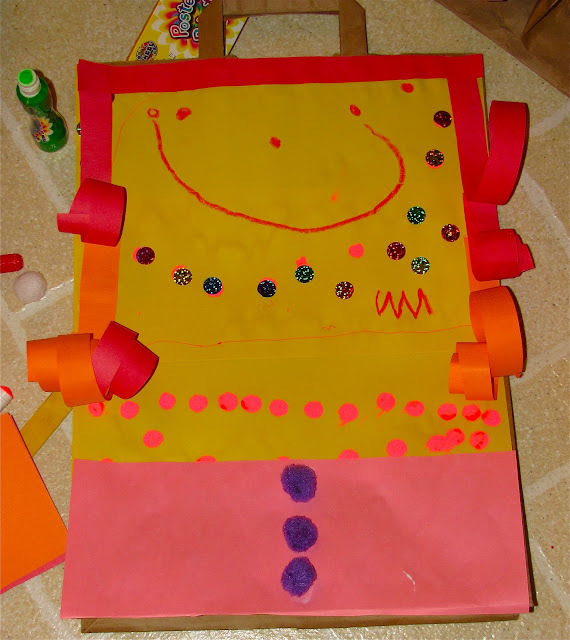 Are you inspired to create a Paper Bag Self Portrait? Wow! What a great idea. Your daughter did an amazing job! I love the vibrant colors! So cute and happy! I love it! Thanks! So may ideas...so little time! This is a wonderful idea! I will remember this next year for our all about me week! Thanks.....hope you can use this idea! That's cool to know about the art therapy connection. Totally makes sense and I imagine it can be a powerful process.I love all of C's creations and can't wait to see what she comes up with for the challenge!! Thank you Rachelle! I thought it was so great with the Art Therapy connection. I definitely want to try a self portrait too.